I sure hope not. KWA lost the production right in 2013 and when into lawsuit with Kriss until it settled last year. I think they are smart enough not to pull another fast one. While Krytac is looking at doing a Vector, it would probably be an AEG (So sez Tim). So those who really want a Vector GBB had better grab one. Only big online retailer I see that still has stock is Redwolf (HK) - at its usual slightly elevated price. Still, not THAT bad a deal. Boomarms I think also have in stock. For $318 bargin town. Ast have some in stock as well. Nope, they don't. They show up, but a warning pops up when trying to add to cart. Oh sorry. Try Johnny from boomarms. I'm sure they have them in stock. Thinking of buying another myself just to have incase they become a thing of the past. When I spoke to KWA when this whole legal thing popped up they did assure me they would continue to make spare parts for it. Which leads me to believe they will release another Vector without trades/slight design changes. That said I've probably put close to 20k through mine and it still feels and fires as new. Wouldn't have the same appeal obviously, but as long as the parts of whatever frankingun they decide to make are the same as the current vector then it's not too bad. 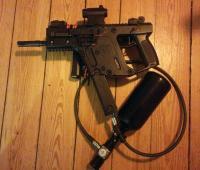 But the vector will be a sought after replica if kwa do stop production. So buying another is not a crazy idea. Plus out of the box this thing is amazing in every department, it's so sad. Nooooooooooooooooooooo! Damn u kwa!!!! Bit of an update from me and my Vector. I've had the current model for around 2 years now and its been through A LOT of use but very little maintenance, if any at all bar oiling the mags and occasional drop into the TMH. Took it out for a game last week, performed almost perfectly. Jammed twice but it was filthy! Stripped it down and gave it a bloody good clean and oil, flawless after that. What impressed me the most was the fact that after probably 15k - 20K or so rounds through the internals look almost new. Minimal wear, in fact there is more ware on my real Remington 870 thats had about 1500 rounds through it which is cleaned bi-monthly. I am very impressed. Totally stock, no upgrades/mods to speak of. Shoots solidly on 340fps +/- 5fps. Still accurate and range is solid. Hop has not moved a millimetre in that time, i've not once had to re-adjust it. If you have the cash and can get one new I would for sure. It has been absolutely outstanding since owning it. As for future upgrades I think I'll go for the ACE 1 Arms right hand mag release to increase ease of use. Maybe the F.E piston head which should improve cold weather/cool down performance do to letting less gas escape. Anyone fitted it? Really DO NOT like all these M4 stocks they keep going mad for over in the US. Uuuuuuurrrrrrgggghhhh. Really don't like m4 stocks on smg's (like the vector and MP5k). Wonder if kwa gave Kriss cooties? Just kiss and make up already. Hahaha maybe, i expect we will never know the true reason. Probably Kriss just want to make its own Vector through Krytac. Some guy on the KWA Kriss Vector group claimed that he talked with Krytac and they are coming out with a Vector...AEG. Anyone know if they experimented with a paddle style mag release on the RS at any stage? It seems like it would be easier than messing with the awkward current placement of the mag catch. Seems like a recess could have been built into the extended mag sleeve and new baseplates for regular mags. They did, vaguely remember reading something on a US RS forum (maybe ar15?). Im look at getting one myself next payday. Why no question on continuation of the superior GBB version? Also, where's that guy from? 'Kah-weh-uh'? yes gbb am bestest. Aep can eat my poo. Both of these posts are really getting ahead of themselves I think, the AEG version hasn't been released so we don't know which is superior and we don't know a single thing about the gearbox it'll have so we can't say it's an AEP. Aside from that, AEP means automatic electric pistol, the KRISS isn't a pistol therefore it cannot be one. GBB version is superior in that lots of people prefer an SMG to be GBB and would consider it better than the AEG version even if the GBB is finicky and is out performed by the AEG. AEP i.e AEP gearbox not full size AEG box. It simply does not matter if it is out or not. Its electric and therefore cannot compete with the awesomness that is the KWA. As above. Even IF it can out perform - which i doubt - it will not be as good or as fun. Bought the Ace 1 Arms Right Side Mag Release. Rather excellent piece of kit! Cheap, very well made and works flawlessly. Reloading is now much easier and much quicker! And now on HPA! For those pesky, and very abundant, sub 20C days when nothing seems to work for more that 10 seconds with Green Gas. Z-Parts from France, makes some plug and play adapters for KWA mags. It fits straight in the fill valve threads so you can go back to gas if you want. No point in doing irreparable damage to your very expensive mags. It fits the, also french made, BalystiK quick detach.